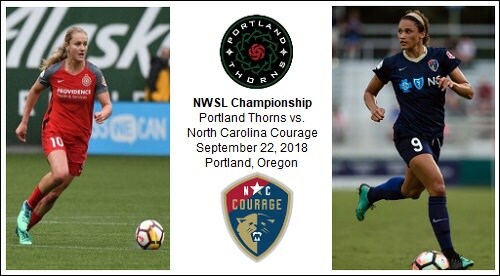 We here at SCtoC will be following the National Women's Soccer League's Championship Match as the Portland Thorns face the North Carolina Courage. We will try here, on this page, to provide a capsule for following the match. The teams met last season for the championship with the Thorns claiming the title in a 1-0 decision. The Thorns won the NWSL Championship in 2013, while the Courage, known as the Western New York Flash, won the NWSL Championship in 2016. What: The Courage and the Thorns face off for the sixth NWSL Championship. When: Saturday, September 22 at 1:30 p.m. (PST). 2018 Records: Thorns - 42 pts (12-6-6). Courage - 57 pts (17-1-6). Goals For: Thorns - 40. Courage - 53. Goals Against: Thorns - 28. Courage - 17. Head Coaches: Thorns - Mark Parsons. Courage - Paul Riley. Thorns NWSL Semifinal: Thorns def. Seattle Reign 1-0. Courage NWSL Semifinal: Courage def. Chicago Red Stars, 2-0. Note I: This will be the third appearances in the championship match by these teams. The Courage relocated during the off-season following the 2016 season from Western New York as the Flash. The Thorns defeated the Flash in New York, 2-0, to win the inaugural NWSL championship in 2013. Thorns midfielder Tobin Heath, who has been with the team since its first season, was named Most Valuable Player in that match. Note II: Courage head coach Paul Riley was the head coach for the Thorns during the 2014 and 1015 seasons. He is in his third season at the helm of the Flash/Courage. Note III: Courage forward Jessica McDonald scored 11 goals as a member of the Thorns during the 2014 season. Photo Above: Lindsey Horan, Thorns; Lynn Williams, Courage.